Many of us are familiar with the Pray, Eat, Pray, pattern of Jewish practice. Well, in this Harvest Season- which is also the spiritual season of birth and renewal- a New Year brings us many opportunities for reflection, renewal and redemption. 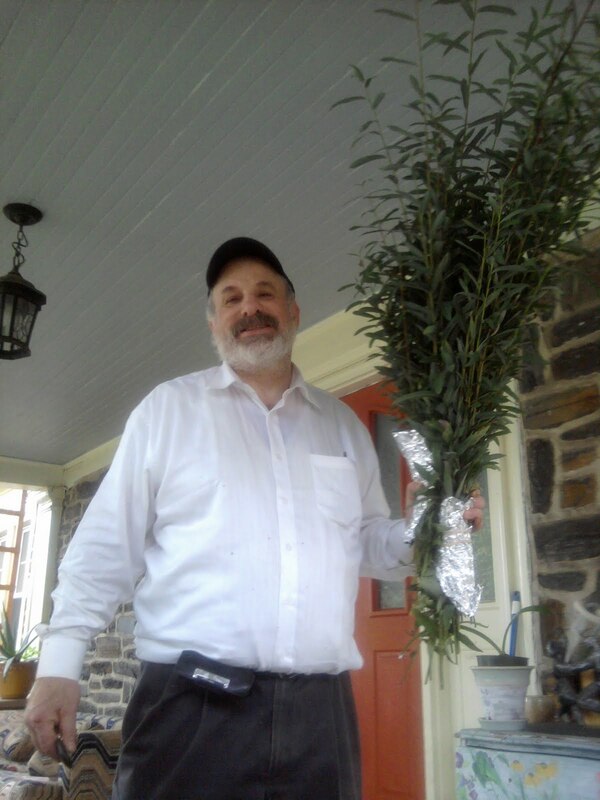 Today is Hoshana Rabbah, bringing us to the end of Sukkos, and time to put away our Lulav and Estrog- Let's take action and put into practice our words to connect mind, body and spirit, to live in a way that our life is our thoughts, deeds and actions. We jsut read in Koheles, that there is a time to plant and a time to sow- well if you want a harvest for next Sukkos, get ready to plant now! It is a time to begin the cycle of a new year- not only in our minds and hearts, but in the very real gardens and grounds that we live on. Keep your Aravos in water and they will sprout roots. Plant the rooted willows into the ground, some sun, shade is good. Become part of the pray, plant and grow cycle yourself. The 'aravos' willows will grow here in the Northest, and almost anywhere- we live in the Philadelphia area and the Aravos I planted almost 20 years ago are now big bushes, whose branches are shared each year with many friends and neighbors and visiting family. In years past we have backed up several institutions even Penn Hillel! Our Aravos harvest seems to grow as it is used, the more you cut, the more it grows! Each year my husband (the green zayda) cuts back the growth on Tammuz 17- (which as you may recall, is a Fast day) Once again breaking with the "pray eat pray" syndrome, it proves that even on days when you are fasting and don't eat, well, you can still foster new growth in the garden, as you cut, pray, cut! If you are reading this after Sukkos, and or you don't have any Aravos this year to root- stop by some time and we will share our Aravos with you. The good thing about Aravos, just like 'bubbies' if they are 'green' they are still alive, ready and willing to grow.